Leaked 2018 Mustang GT B-Roll! A B-Roll video is a soundless video clip supplied by a manufacturer or vendor to media outlets so that they can use segments of it in their reporting. Ford typically creates several of these for most new product announcements. And that’s what this is, and yesterday it was unofficially leaked by somebody: be it Ford themselves, a partner, an employee, or – in this day and age of the internet – who knows. And the video is quickly being picked apart in forums, tweets, chat rooms, and everywhere else with guesses, speculation, hopes and dreams, and a few facts. It also had sound added, clips taken, and the car will probably be colorized by somebody next. 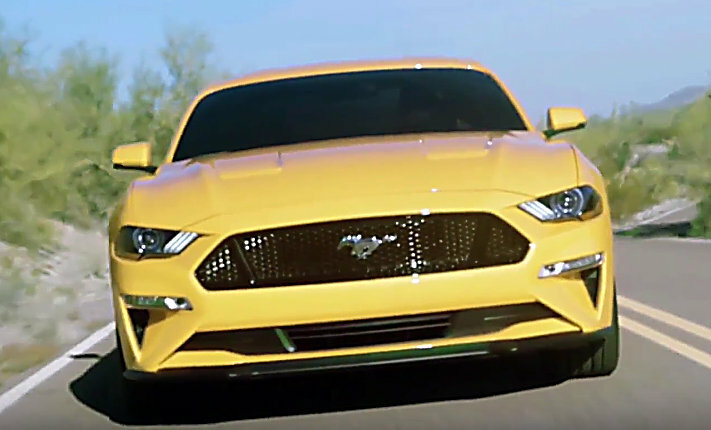 In any case, by some fortuitous means we have the video, it’s the real thing (although the color and focus is poor… which perhaps hints at its source), and it reveals several facts about the upcoming 2018 Mustang GT. Once the 2018 Mustang is officially announced we’ll be back with the full set of images, details, and analysis. But for now we’ll point out the obvious from this video. First, new front fenders. This is an expensive change, whether they are steel, aluminum, or SMC, because of engineering, testing, supplier and assembly costs. Perhaps there is a bit more room provided for wider front tires (aka the unique and much wider GT350 fenders) – although there doesn’t appear to be. HID headlamps make a return, although LED headlights would have been more functional (Ford offers them as options in the F-150 and Fusion and they work great). The new front cap also includes LED turn/running lights mounted in the bumper instead of in the headlamps… and – perhaps – what looks like tiny driving laps. We hope not – because of Federal Government standards these are worse than useless and serve no functional purpose. Note too the provision for airflow thru the side of the cap and over the sides of the front tires, an increasingly common aero aid. 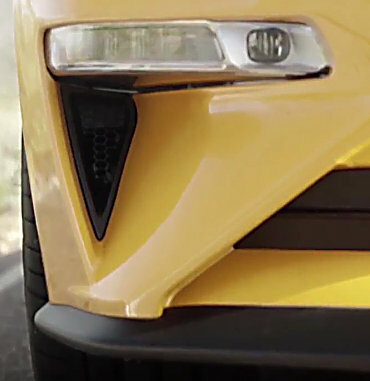 And the front spoiler, as before an extended depth version for the GT and a less aggressive depth for the base cars. The new headlights slant forward on the side rather than backward (awkward styling in the 2015-2017 Mustang, along with the current Fusion). The new fenders accommodate this change. Note int he image below the Brembo front calipers, marking this prototype as being equipped with the Performance Package (which is known to use larger brakes, hopefully providing 4-piston Brembos on the rear as in the GT350 – instead of the woefully inadequate cast iron single piston caliper that has been used for too many years). Also note the Michelin Pilot Super Sport tires (hopefully the all-new PS4S once production begins) which take the place of the older and very outdated Pirellis. There are also handsome new tail lights. The previous tail lights were a bit awkward and out of sync with the back end (especially in the export model clear lenses), but now fit better in the overall styling and also retain the familiar 3-bar pattern. Note the new rear spoiler, too. Then there is the new under-bumper panel, and on this performance model 4 exhaust outlets. The question remains here how functional these will be, and whether the second set of outlets are switched. And speaking of familiar, thank goodness that Ford didn’t resort to fake scoops of any type for the updated Mustang. “Fake” has been the bane of Mustang styling for too many years, especially hood scoops (feeding an imaginary carburetor – ridiculous!) and rear side scoops (feeding an imaginary rear engine – even more ridiculous). The GT has two extractors in the hood and they are thankfully functional (unknown at this early point whether they’ll be able to be included in export models). The grill is a little shorter and essentially the same width as before. And looking closely the actual grill is only a narrow and short slot behind the black plastic, as before. The actual opening is highlighted below. 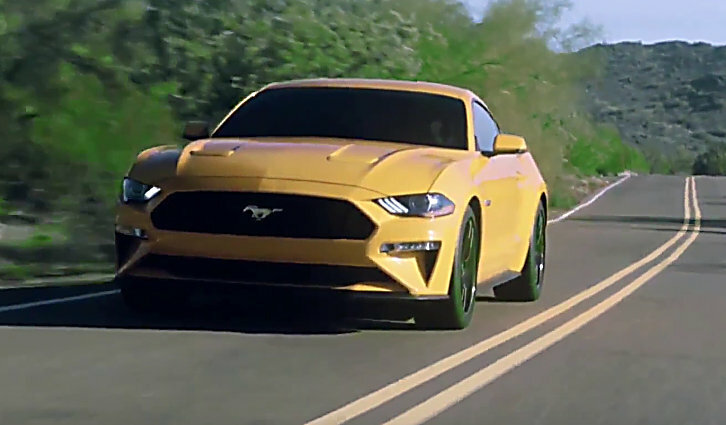 There are also some other things that we know about the 2018 Mustang from other sources, such as the deletion of the V-6 engine (no loss as the boosted 2.3 EcoBoost provides an all-around far-superior driving experience), And the option of magnetorheological dampers. We’re especially looking forward to these as they are the ultimate in dampers and with switchable steps can provide the ultimate control over the broadest range of conditions. 12:1 compression ratio, with 4 knock sensors for improved and per-cylinder spark control. The GT version of this 5 liter will include, as before, higher-flow intake and exhaust manifolds, different camshafts, and more aggressive tuning. Power numbers are not available for the F-150 version yet and we’d expect these numbers as well as the Mustang numbers much later in the year as production begins. But clearly we’ll see a fat increase in torque as well as some additional HP. 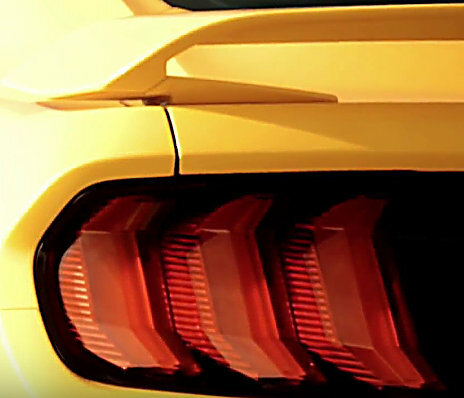 How close it will approach to the Camaro’s 455/455 HP and toque remains to be seen (and remember that the Camaro weighs less than the Mustang). What’s missing from the F-150 and GT engine? For one, the rumored 4.8 liter “all-new” engine. A displacement leaked by the UAW during contract negotiations… perhaps referring to a far-off replacement for the 5 liter. Shorter term, cylinder deactivation is missing; this is a fuel economy and competitive feature. Although in the F-150 the most popular engine is the 3.5 EcoBoost, providing both fuel economy engine and superior performance, so there is little reason to budget and engineer cylinder deactivation for the 5 liter. So here we have the 2018 Mustang, a mid-cycle refresh that will carry the line Mustang until it is replaced in 2020. Time marches on… but meanwhile we know from spy pictures that there are further models to be announced this year including a model or option package positioned between the GT and the GT350, and a model above the GT350. We’ll look forward to seeing those announced later this year.